You speak two languages… at the same time! Here’s one that occurs quite often: you switch between two languages all the time and sometimes, you mess up. When speaking to friends and family back home, I obviously speak Dutch. When going to university or my job, speak to my friends and go shopping, I speak English. When I’m tired or not paying attention, I sometimes find it hard to make a distinction between the two languages I speak fluently. Because both languages are so natural to me, I sometimes hear English and think it’s Dutch and vice versa. English is now my most used language. I live in the UK, I work in the UK, my boyfriend and my friends are English… The only time I speak Dutch is when I call my family or my friends back in the Netherlands. Because of this, I tend to forget certain Dutch words. One of the most annoying things you can ask a bilingual person is to “translate this quickly!”. As soon as people realise I’m not a native English speaker and that I speak another language, they ask me to say something in Dutch. Usually, they don’t even give me something to translate, but they want me to say something randomly. At first, I thought it was kinda funny. But after a few years, it gets a little bit annoying. 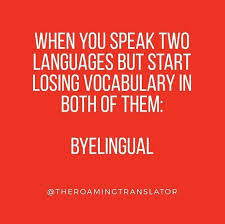 Speaking two languages on a daily bases can be incredibly tiring! Especially during the first few months of living in the UK were really tough. It is definitely getting better, but every now and then it happens again. When I get stressed or don’t speak well, none of my languages work very well and I end up making tons of mistakes in both! Okay, okay, okay. I hope you understand this article is a little piss-take 😉 Yes, these things are kind of annoying but being bilingual is absolutely incredible. I have helped me in so many ways! It allowed me to do things I never could’ve imagined doing and I’ve spoken to so many interesting people I never could’ve spoken to otherwise. Being able to speak two languages has opened so many doors for me and I am a hundred percent sure it is going to influence a big part of my future too. Seriously though, being bilingual has way more pros than these silly cons. It takes some effort but it will pay off! Here are seven top tips to learn a new language. about this topic i want to give a reply:) i truly understand your feeling. i can speak 4 languages. dutch, chinese, english and german. and some broken other languages too. that makes me to topic 2 my brother and i we speaks in a mix languages that nobody can follow our conversations. of course some words we don’t know or remember we just say it in the next language what to word we know. but i made mistakes often in japan holiday. i speak with friends in english and with my girlfriend (now ex) in german but sometimes i turn my head to her and speak english and to other friends german hahahaha so embarrassing. but i starting to forget chinese and dutch more and more. i didn’t have so many chance to speak in those 2 . i’m always happy if i heard dutch customers. i said to my colleagues these are mine customers and start with hoi kan ik u helpen? Haha I recognize myself so much in these stories! My boyfriend is learning a little bit of Dutch and we speak in a mixture of Dutch and English that nobody can understand here in England, but it’s so funny! If you ever need to practice your Dutch just send me a message on instagram ^_^ Always happy to help!